More and more people suffer from their tight jaw. One result causes teeth problems. So people visit a dentist `cause they are aware of these problems and not of the chronically tensed jaw. Mostly the dentists don`t know the reason for the teeth problems. So they call this syndrome “bruxisme”. People feel some kind of a respect towards such a diagnosis and follow the dentist`s indication for a while. But as there is no real change they stop. 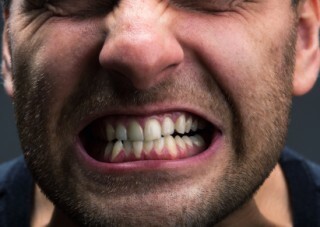 By the way “bruxisme” only means teeth crunching. Using a Greek labeling the diagnosis sounds important. But ………..it only covers and hides the dentist`s helplessness and ignorance. I so far this just seems to be a common bluff in medicine. The fact which makes me pick up this aspect is that people in general stay blind towards the underlying severe problem. This could be called unconsciously tensed jaw muscles and thus blocked emotional that means aggressive feelings. The fact that this muscle is the most powerful, strongest muscle in the body you can imagine the intensity of the blocked aggression. (The pressure per cm is about 300 400 kg). The stronger the block against feelings is the stronger the blocked feeling is. And even more a tensed jaw will influence the well-being in the whole body segment: ears, neck, upper shoulder and the face. The fact also is that withheld, blocked aggression nourishes our dreams. So in consequence you either will have a restless night, will not sleep well and really relax. Or you will have dreams full of symbolic aggression or even nightmares. So the advice could be not to visit the dentist. Instead of this be aware of (un- or half-) conscious aggression. Visit a bodypsychotherapist or stand for yourself and your needs and interests. And don`t hide behind a Greek named “illness” or even feel safe there. It`s an illusion.